Though the 1990s doesn’t seem too far in the past, the home styles of that decade were distinct and didn’t exactly land in the “timeless” category. 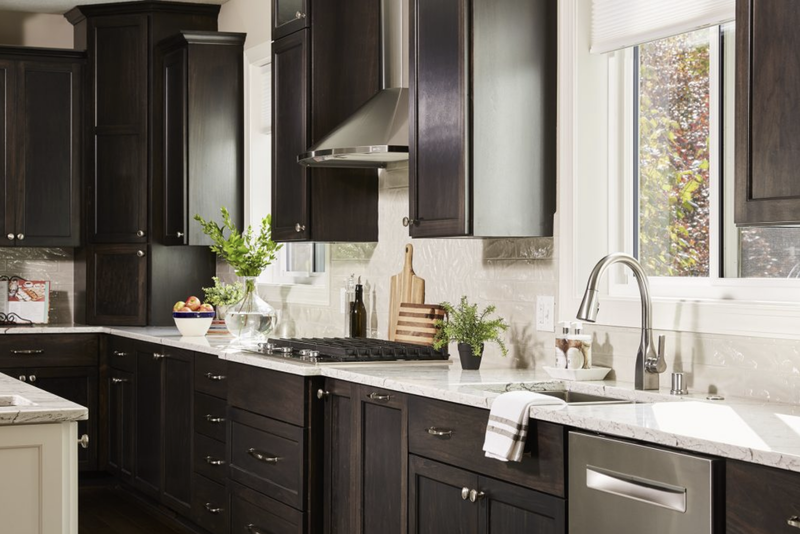 From ultra-earthy tones to oak cabinets, if you’ve got a kitchen that was finished in the heyday of that time period, you’re probably dying for an update. The good news is that kitchens like these aren’t total goners and there are so many ways to transition your space into that contemporary style you crave. Today, we’re highlighting four of our 1990s kitchen projects and talking about how we created updates that really packed a punch. Read along for inspiration and get ready to transform your own space into one you absolutely love. 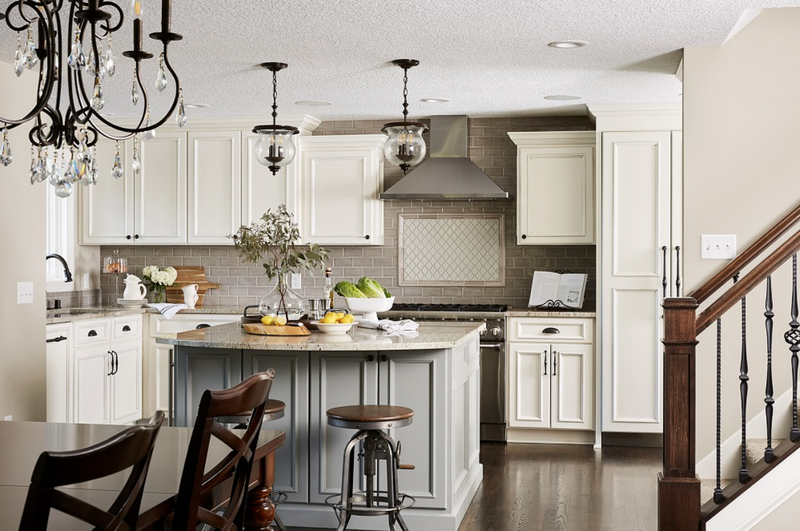 Over the years, the owners of this home tried to update their kitchen, but unfortunately, with a room steeped in 1990s style, paint and hardware could only go so far. The result was a space filled with earthy tones – from the oak cabinets to the burgundy walls and brown granite – and the finishes were a collection of mix & match styles and metals that made the room feel disconnected and unfinished. 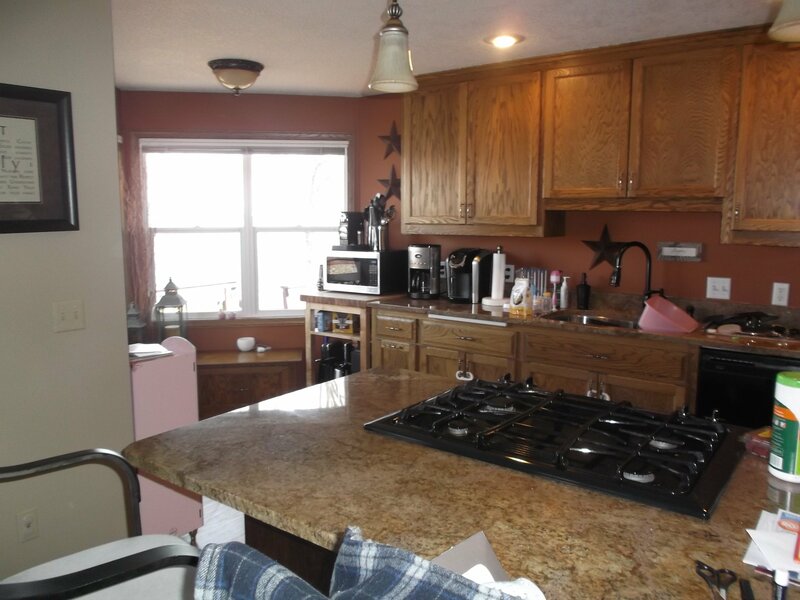 Oak cabinets and brown granite kept this kitchen stuck in the 1990s. 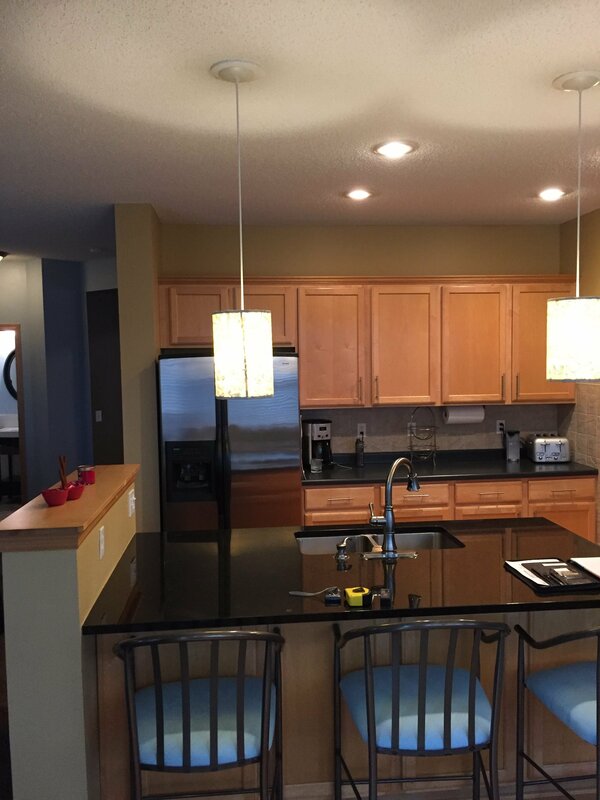 The darker earth tones in this kitchen made the space feel dark despite the large windows. 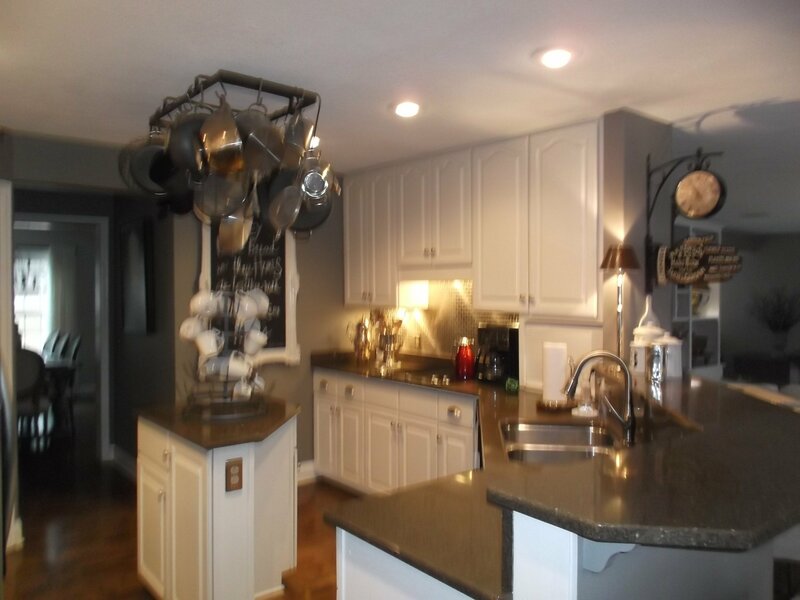 The island in this kitchen was functional, but rather than creating space, it felt crowded because of the dark colors. 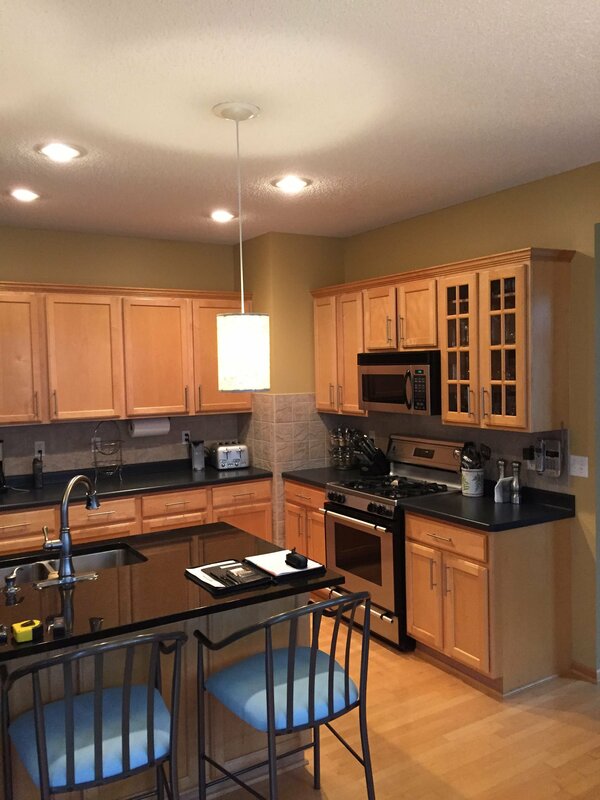 1990s-style light fixtures and appliances made this kitchen a mix-and-match room that lacked cohesiveness. We knew that by brightening everything up and keeping a cohesive classic vibe, we could completely shift the look and feel of the kitchen. 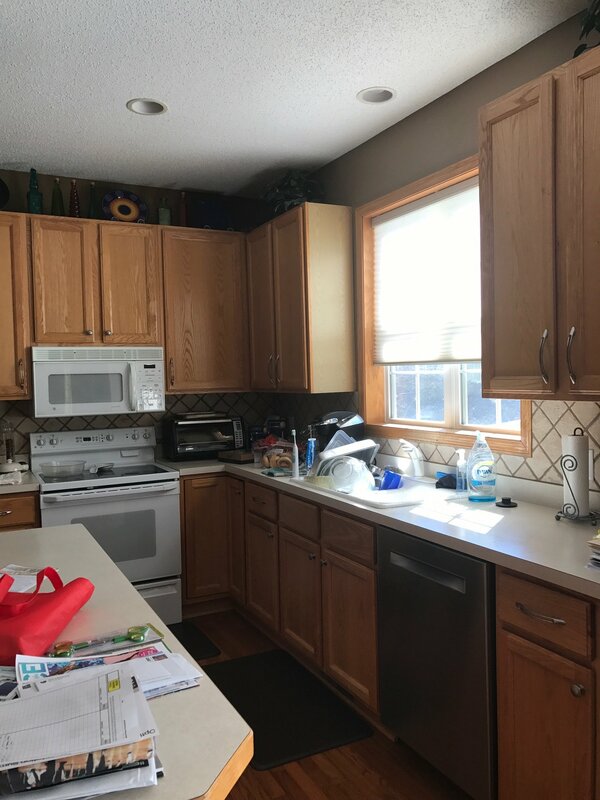 Out went the oak cabinets and the outdated colors, and in came warm white cabinets paired with a soft grey center island in an upgraded and refined shape (with plenty of storage beneath). 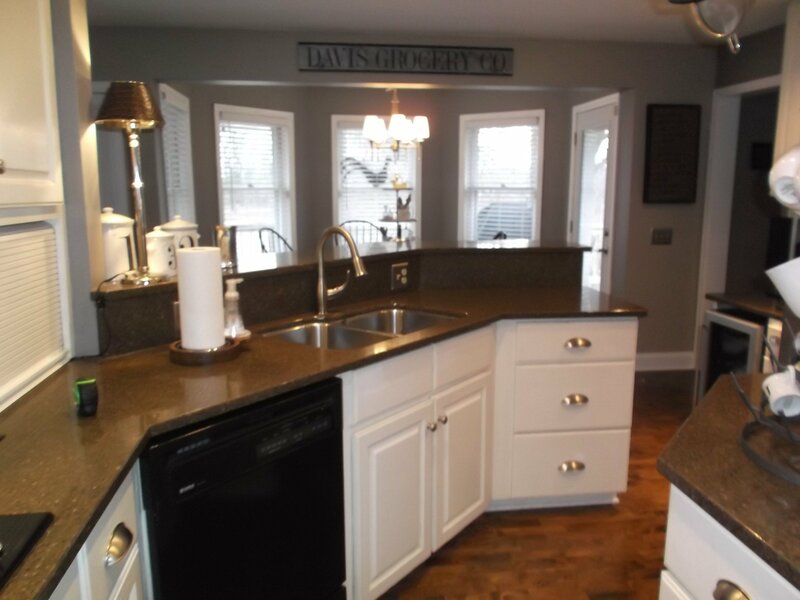 The granite countertops blended warm and cool tones, and a warm grey backsplash helped to connect the space. For finishes, we kept things simple and classic, using oil-rubbed bronze for the faucet, light fixtures, and cabinet hardware, and we opted for sleek stainless-steel appliances with the refrigerator hidden behind cabinet panels for a sleek and bright look. Overall, the kitchen became not only a visual beauty, but also a space with plenty of room to comfortably enjoy day-to-day tasks. A soft grey kitchen island pulled a touch of coolness into this space, offering contrast to the warm white surrounding cabinets. A hidden refrigerator was positioned behind custom cabinet panels, giving the kitchen a cohesive and bright white look. 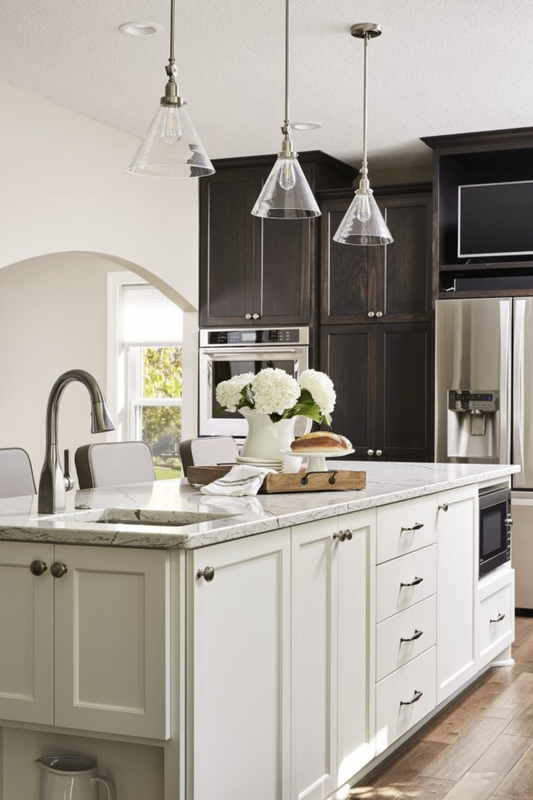 Touches of warm grey and soft white throughout this kitchen paired perfectly with the oil-rubbed bronze finishes for a streamlined and classic aesthetic. 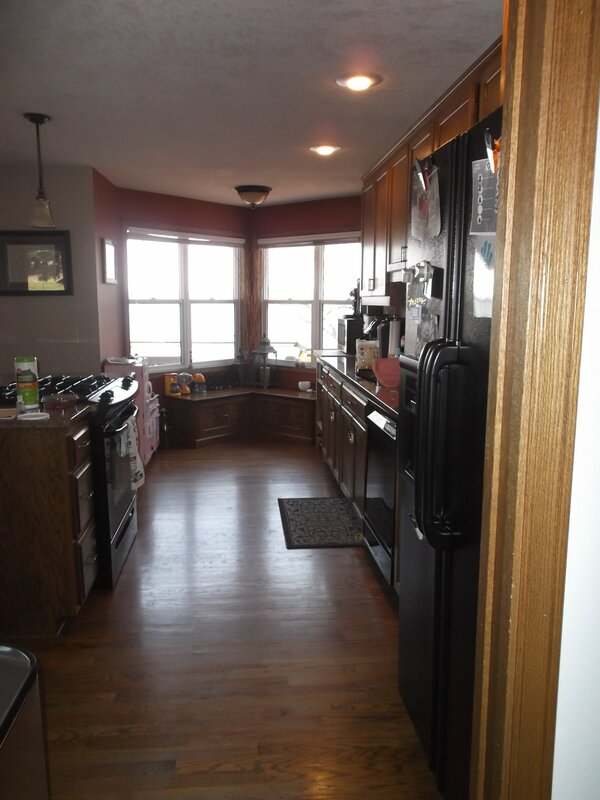 Aside from the oak cabinets, deep tones, and outdated countertops, what this space needed more than anything was to be opened up. 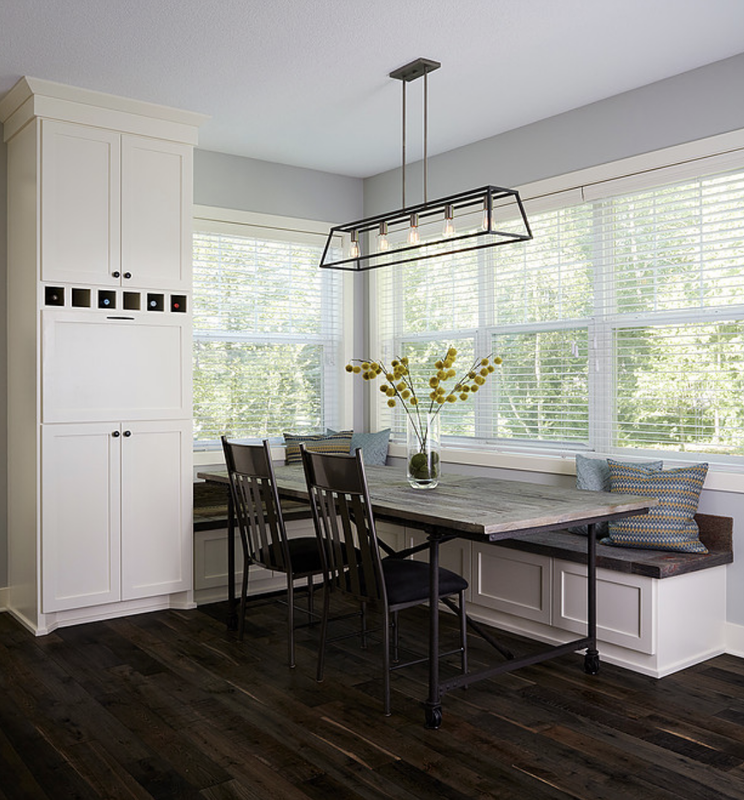 Separate dining spaces were popular in the 1990s, but the open layouts of contemporary design are much more user-friendly in today’s world, and the owners definitely wanted their home to feel more connected. 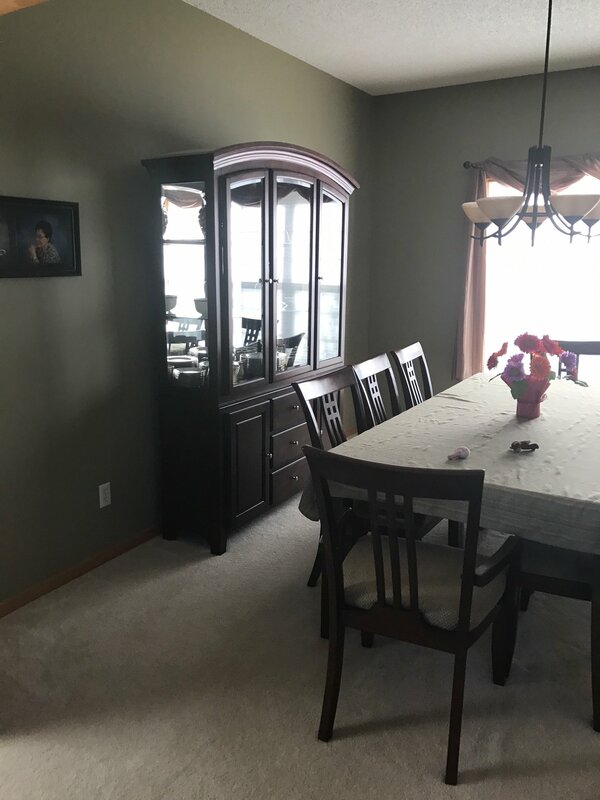 This separate formal dining room was spacious but felt disconnected from the activity of the kitchen (and as a result, was not used as much). In this 1990s-era kitchen, oak cabinets and laminate countertops took center stage, making the space feel bland and in need of a revamp. 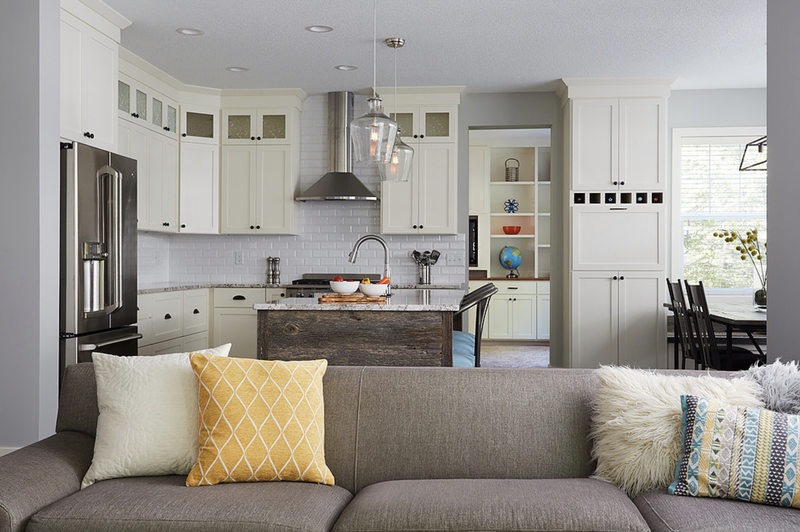 Appliances lacked cohesion thanks to updates over the years, and the owners knew they wanted a more curated look that felt complete. The biggest change we made was opening up the dividing wall between the kitchen and dining rooms, which helped connect each area and make movement throughout the space much easier. 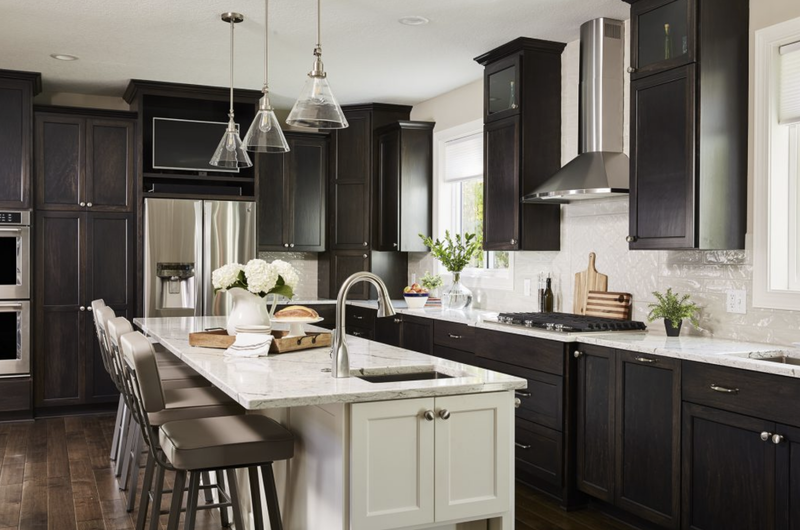 We opted for darker stained cabinetry for a sophisticated look and contrasted these with a warm white kitchen island (and plenty of extra seating!). 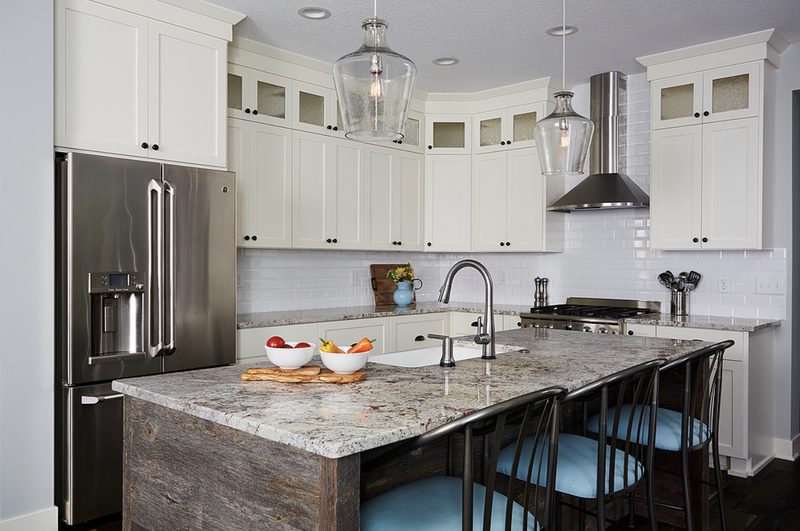 Finishes and hardware were chosen in stainless steel and brushed nickel, and we used clear pendants above the island to keep things feeling light and airy. 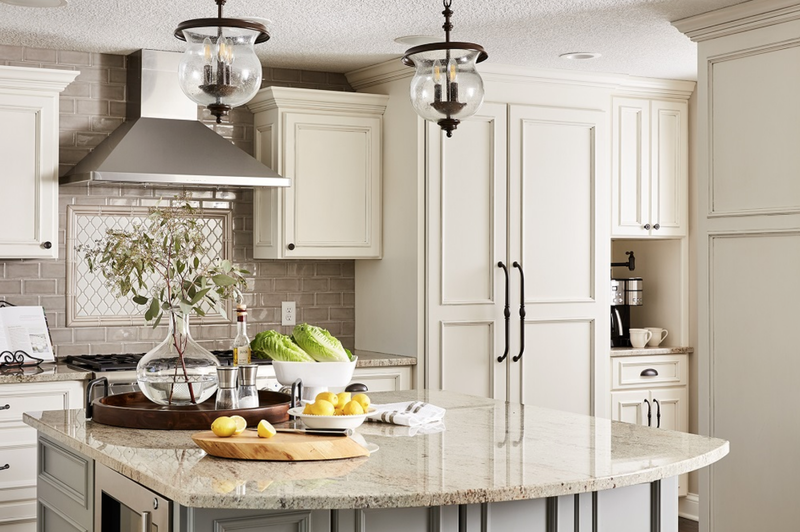 From cramped to classic, this kitchen was instantly transformed. 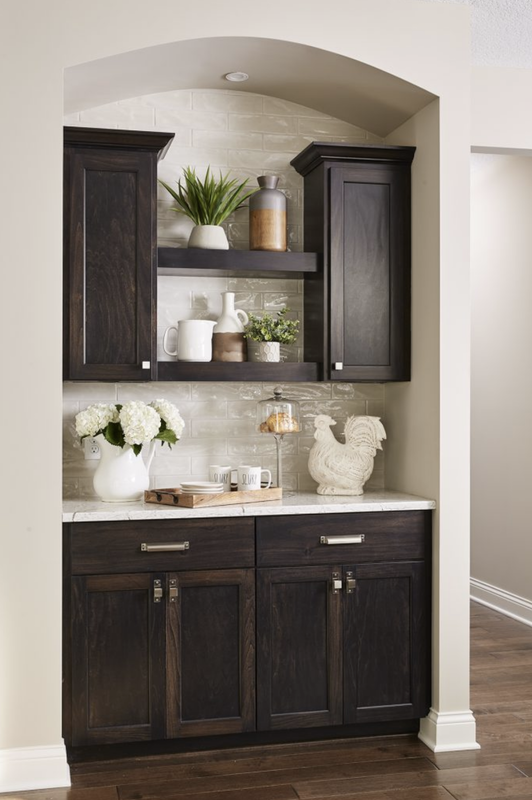 Rich, dark kitchen cabinets against a light backsplash and walls made for a sophisticated kitchen style in this home. A white kitchen island with a light quartz countertop contrasted perfectly with the surrounding dark cabinets in this kitchen. 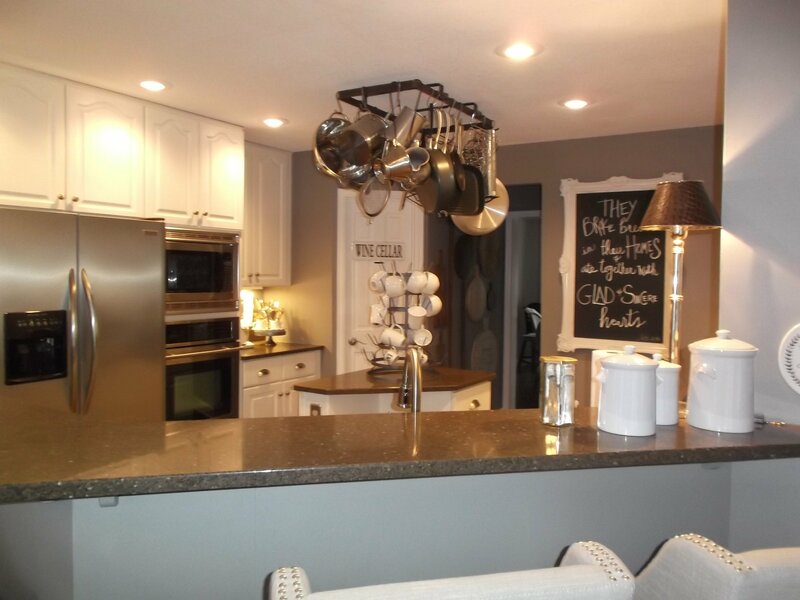 Stainless steel appliances and brushed nickel finishes kept things cohesive and classic in this kitchen. 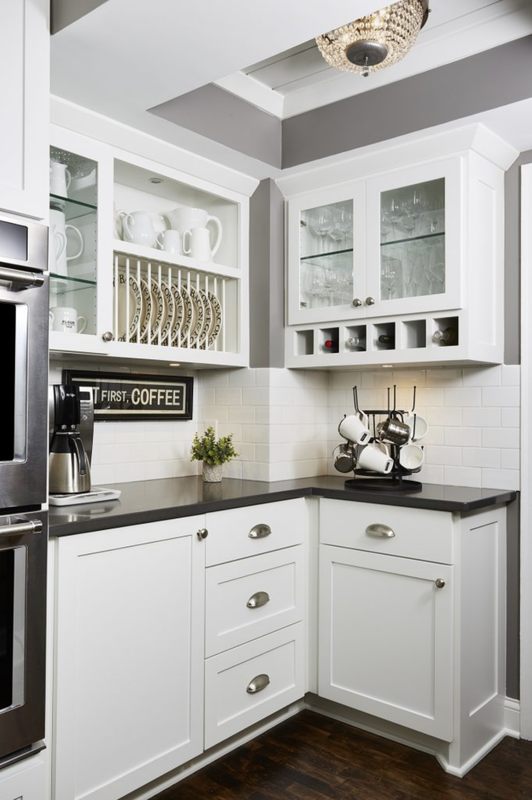 A coffee bar offered an extra storage nook in this kitchen, using wall space strategically and functionally. This kitchen, though open to the adjoining dining and living room spaces, still felt a bit outdated with its light wood cabinets, dark granite, and sharp angles. The green walls kept it feeling a bit too warm and muted as well, and overall, the space was definitely in need of a contemporary upgrade. Warm green walls and light warm cabinets kept this kitchen feeling a bit too 1990s in style. An open layout was convenient for this home’s owners, but the sharp angles and dark tones made the space feel cramped. 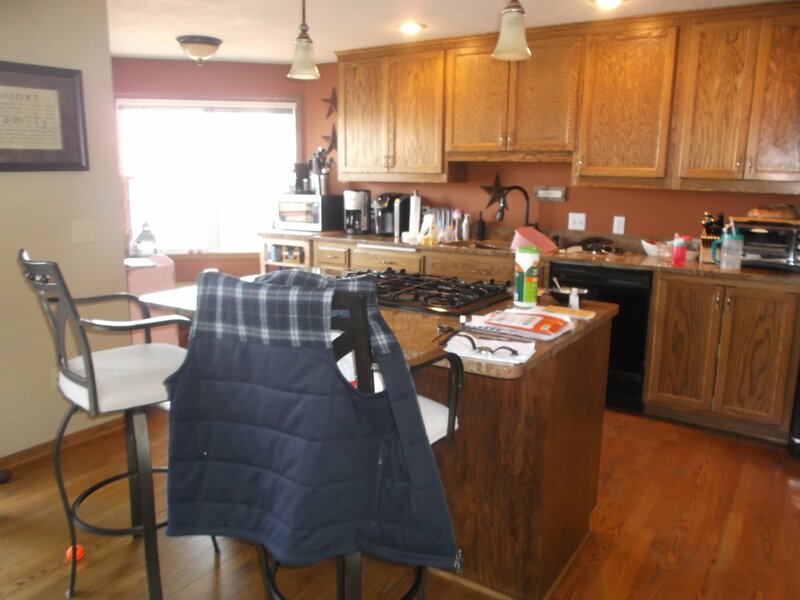 Black countertops were a bit too much of a contrast against the warm wood cabinets, and made the space feel much smaller than it was. Keeping the general layout the same, the biggest need in this kitchen was a brighter aesthetic and more contemporary finishes. So, we opted for a modern farmhouse look with a reclaimed wood island, a built-in dining banquette, bright white subway tile for the backsplash, and warm white cabinetry. The result was a bright and airy space that felt both open and fresh. 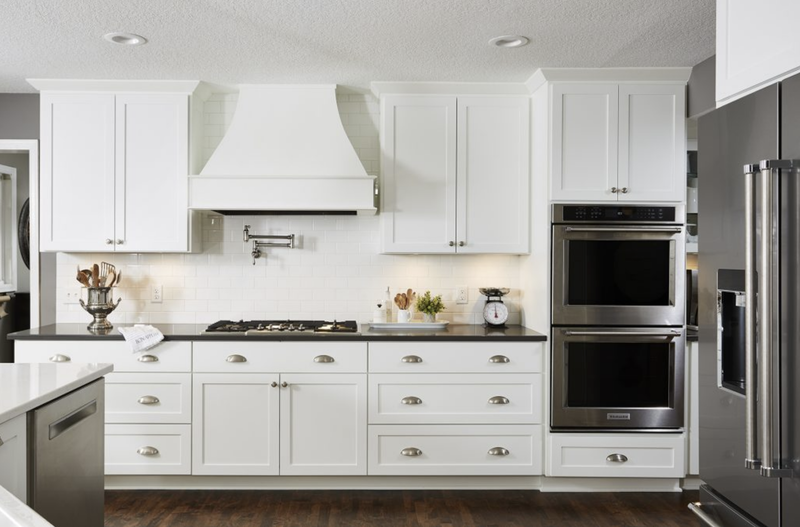 Warm white cabinets paired with bright white subway tile instantly made this remodeled kitchen feel lighter and more open. Reclaimed wood pops in the dining room table and built-in bench seating gave this kitchen a modern farmhouse aesthetic. A focus on lighter hues in this newly remodeled kitchen helped the already-open layout feel even more welcoming and spacious. 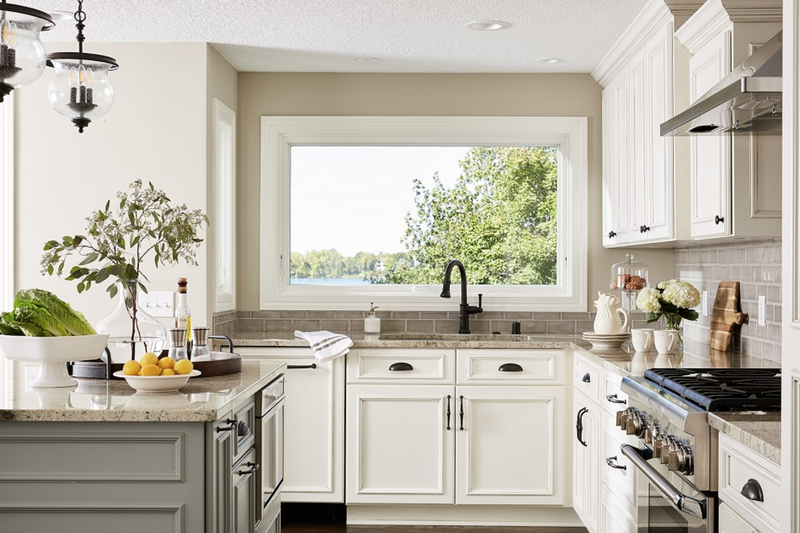 While this kitchen had some nice elements, what the owners wanted more than anything was to open it up a bit and ditch the two-tiered kitchen peninsula. 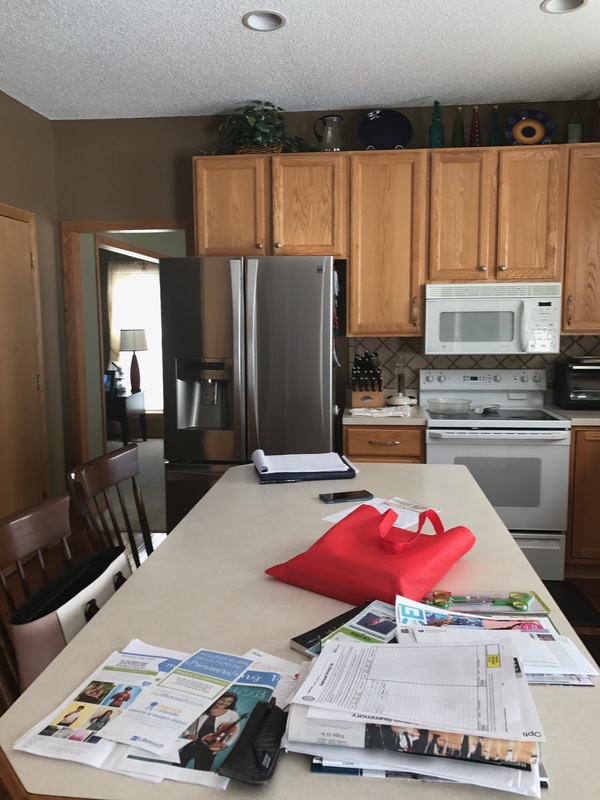 There was ample room to cook, certainly, but the space still felt outdated and too dark – a hallmark trend combination of the 1990s. The owners of this outdated kitchen wanted to open things up and make the space feel more contemporary overall. 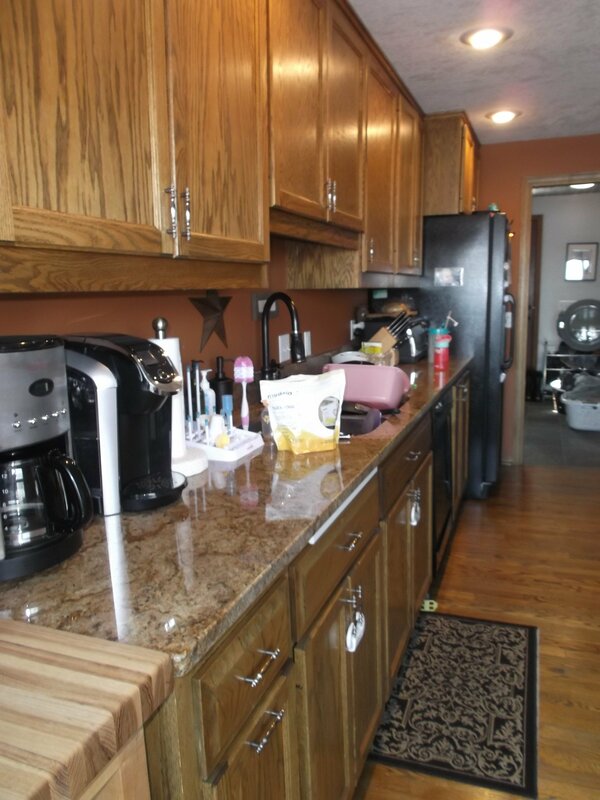 A center kitchen island coffee bar took up a lot of floor space in this 1990s-style kitchen. A two-tiered kitchen peninsula made the countertop space feel diminished and blocked the view around the room. 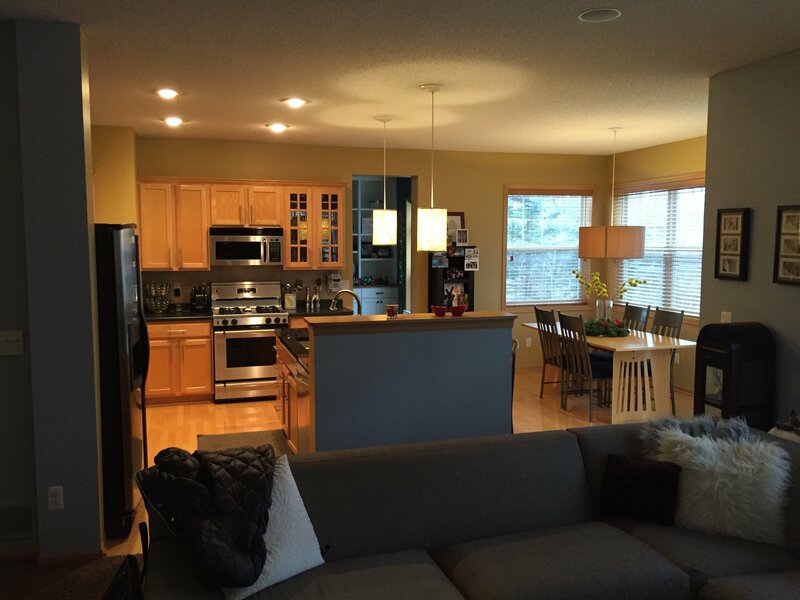 Though we kept the general layout of this kitchen the same, we made some significant changes that helped the space feel much more open and functional. The first was to replace the peninsula with a more contemporary rounded island, getting rid of the extra tier in the process. This made the countertop much wider and as a result, the view was not blocked. The second change we made was to completely eliminate the center coffee kitchen island, instead creating a coffee nook in the corner, which served to open up floor space. And finally, we brightened everything up with white cabinets, stainless steel and brushed nickel finishes, and a classic subway tile backsplash. With grey walls to contrast it all, this space instantly became a family favorite fit for everything from cooking to entertaining. 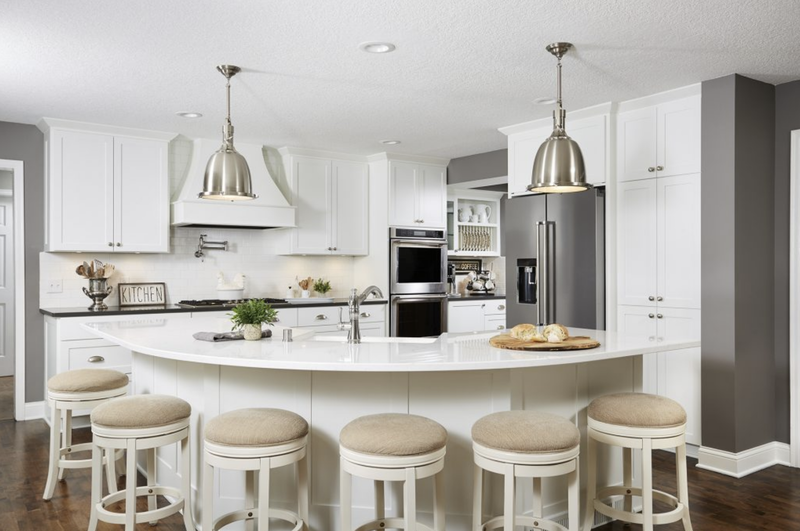 A new rounded kitchen island with ample seating gave this kitchen a contemporary and open vibe. Bright white countertops were built around a farmhouse-style sink for a classic and timeless kitchen aesthetic. All-white cabinets and backsplash were paired perfectly with a sleek grey quartz countertop for a classic look in this open kitchen. A coffee nook was created to be both functional and stylish in this updated contemporary kitchen. Ready to tackle that outdated 1990s-style kitchen? Pull a bit of inspiration from these projects and we guarantee your home will feel brand new and exactly as you imagined it to be. Founded in 2015 by Carla Bast, Sneak Peek Design was created to bridge the gap between homeowners and builders. Sneak Peek Design provides a one-of-a-kind 3D virtual and collaborative design process for kitchen + bath remodels, additions, whole home renovations, and new construction.